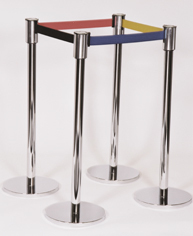 Turnstile Security Systems Inc’s belts are six feet long, made of rugged nylon, retract firmly back into the head of the post and come in a selection of colours. Name imprinting on the belts and post tops are available at moderate costs and volumes. Universal wall mounted head and individual receiver provides subtle and inexpensive traffic movement in confined spaces or aisles. Can be used wall to wall, post to wall or vice versa. Devon Technologies is an Approved Dealer of Turnstiles Security Inc. For further details or information please contact us.